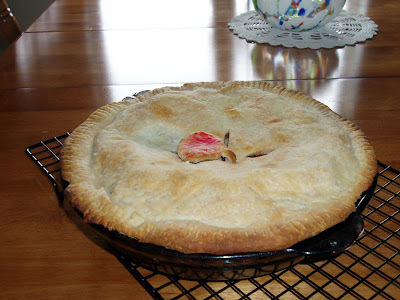 The Witch's Island: Homemade apple pie. Yummy. Right now there is a delicious apple pie cooling on our kitchen counter just waiting to be served up with a piece of cheddar cheese as a side kick. We're also cooking a nice beef stew as I type. We used carrots and onions from our garden, and well, the potatoes where a free gift of sorts. You don't really want to know the details, but all the farm fields are being harvested around here. The laundry is all done as well as the house cleaning and I'm wondering why we can't have three day weekends every week. Really, it's getting hard to do my household chores and blog. Oh, my! Don't worry I'm not giving up blogging. It has been a great stress relief and I do enjoy visiting other blog sites so much. I'm going to update my sidebars with new sites soon. Hopefully, anyway. We don't eat apple pie with cheddar here (I've tasted it though and it's good)... I may have to try it more often. My favorite way is a la mode (with vanilla ice cream). Hope the potato growers can get into the fields ok, it's been terribly wet! !